United Arab Emirates, 13 October 2015: To kick start your winter on a healthy note Daman’s ActiveLife Electric Run and Fitness First has joined forces to encourage UAE residents to set a new goal this season over the cooler months and sign up to the World’s Brightest 5K night run. The global phenomenon and one of the world’s most social fun runs, Daman’s ActiveLife Electric Run, will be lighting up Dubai on 6 November where thousands of Electric Runners are expected to take to the start line at Meydan. With less than a month to go global health brand and official fitness partner, Fitness First, has launched an exclusive offer for all UAE club members offering 10% off event registration for a limited period of time (12 October to 26 October). Similar to Fitness First’s vision to bring fitness into people’s lives, organisers of Daman’s ActiveLife Electric run, Fast Track, are keen to motivate local communities to sign up for what is set to be a night run to remember. “Daman’s ActiveLife Electric Run is unique combination of fun run with an unforgettable fusion of music and light; but just because it’s fun doesn’t mean there shouldn’t be some prep involved. The clubs provide Electric Runners with the tools to help everyone – whether you are a professional runner or a beginner – to easily train for this 5K night run and most importantly have a great time doing it,“ said David Sanderson, Race Director. Organisers are calling on all Daman’s ActiveLife Electric Run fans in the UAE to register today and get ready for the exciting 5K night run with friends and family. To avail this exclusive offer, Fitness First members can visit www.ElectricRun.ae and use a discount code which comprises their 8-digit membership number and year of birth. When they register on the event website members can use this unique code upon checkout to get their 10% off. This offer is only valid for individual registrations. Daman’s ActiveLife Electric Run is a celebration of health and happiness where participants can run or walk their way through a kaleidoscope of neon lights and energetic beats. 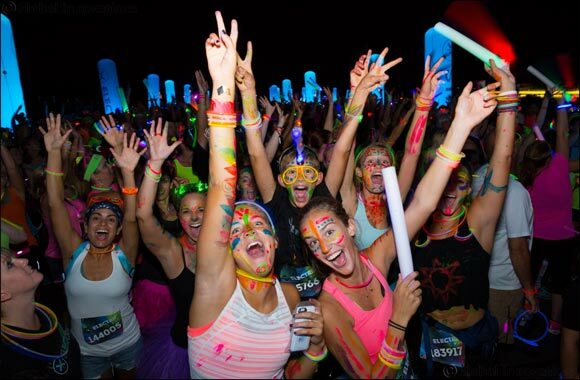 Electric Runners will also have the chance to get decked out in the most vibrant, neon attire and become part of the thrilling show which culminates in an electrifying end of race concert. Registrations for Daman’s ActiveLife Electric Run are available at www.ElectricRun.ae and at all Fitness First Clubs in the UAE. Individual registrations are for AED 200 while teams of four or more receive a lower rate of AED 180 per person. Prices will increase from 25 October so fans are encouraged to save their spots as soon as possible.